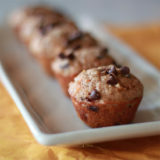 As grown-up-friendly as they are kid-friendly, these bite-size whole-wheat muffins boast carrots, cinnamon, and an irresistible sprinkle of chocolate. We’re still dealing with a seriously picky-eating toddler over here. I joke that bacon is one of her food groups; except that’s not really a joke – it’s kind of the truth. And if she had her way, chocolate would be another food group. At least our kid has something in common with her vegetarian chocoholic mama. If we want to feel reasonably confident she’ll at least try something, we take a cue from Portlandia: we put a bird on it. Except, you know, not a bird. A mini chocolate chip. Or 5. It also helps when she “assists” in the kitchen, and muffins have sort of become a morning ritual for us. 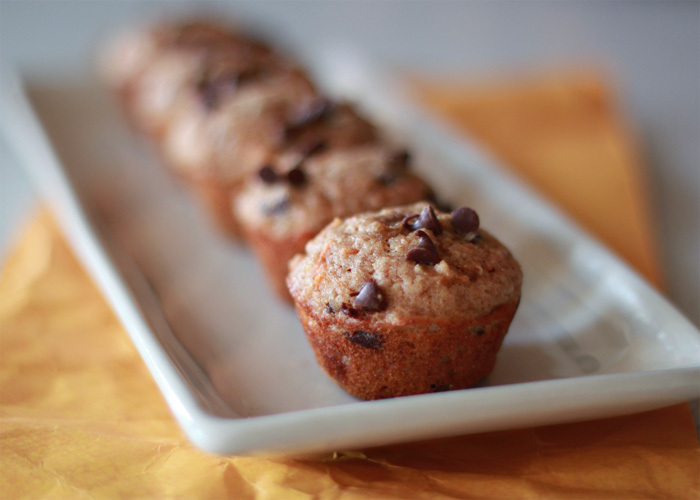 Earlier this week, we made these Whole Wheat Carrot Chocolate Chip Mini Muffins. She got to sprinkle the chocolate chips on top; I got to hide veggies in her muffins. She got to quality test every other chocolate chip that passed through her hands; I got to sweep the flour off the floor. Yin and yang, my daughter and I. The dynamic muffin-making duo. She loves these little muffins – they’re just her size. Sure, they have mini chocolate chips in them, but they also have lots of good stuff, too. And, hey – no bacon in sight for once! 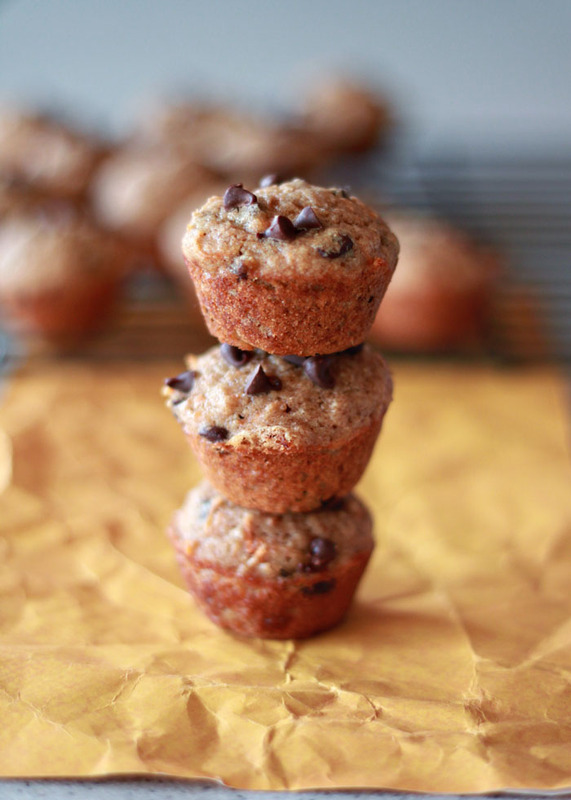 These hearty little muffins are made with 100% whole wheat flour, carrots, brown sugar, and mini chocolate chips, along with, of course, a few other standard muffin ingredients. The carrot is pretty subtle, though the combination of carrot and cinnamon do give these a bit of a carrot cake vibe. The only problem I have with these? Keeping enough around for my kid. 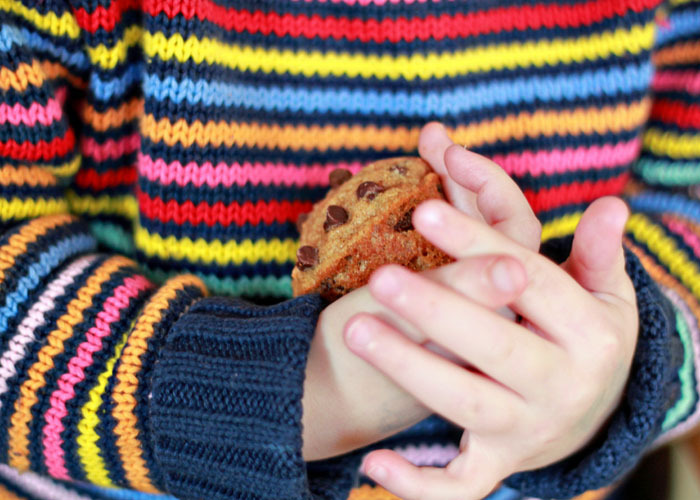 With their chocolate chips and cute mini size, these are entirely too irresistible for adults, too. In a large bowl, stir together the flour, brown sugar, baking powder, cinnamon, and salt. In a small bowl, beat the egg and then whisk in the carrot, milk, butter, and vanilla. Pour the wet ingredients into the dry and stir just until combined. Add the 1/3 cup chocolate chips and stir to incorporate. Divide the batter between muffin tins - about 1 1/2 tablespoons each (I use a cookie scoop). Sprinkle the tops with additional mini chocolate chips. Bake for about 8-9 minutes, until muffins are no longer jiggly and a toothpick inserted into the center of one comes out clean. Let cool for about 5 minutes in their tins, then carefully remove and place onto a wire rack to cool completely. 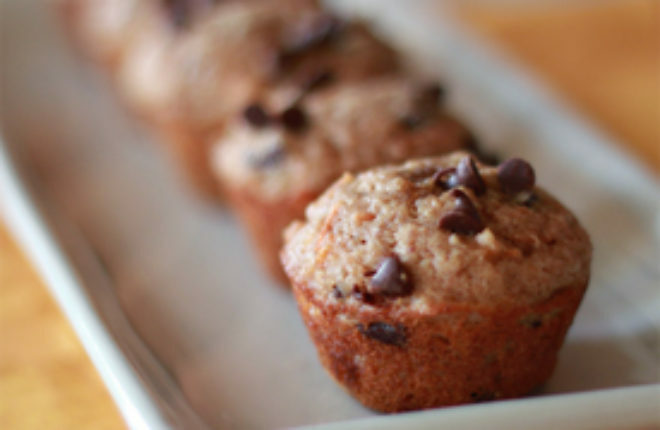 These muffins keep 2 - 3 days at room temperature in an airtight container, or freeze. These are so darn cute, and I love that they have carrot hidden in them! So smart. Looks so darling! Carrot cake in mini form? Love the sweater! Did you make that also? Delish as is, or, I substituted coconut oil in place of butter. Consistency stayed the same. I’m freezing them for lunches so that I’ll stay out of them! These look great! If I wanted to make them as full-size muffins, would I need to lower the oven temperature so they don’t burn when cooking for a longer time? I made these using full-size muffin tins and they turned out delish! I added some walnuts to the recipe and baked at 375 degrees for about 18 minutes. The recipe made 9 muffins on the small size – next time, I’ll double the recipe! I made 12 regular size muffins, although they were quite small. I baked at 375 for 18 minutes, but I think I could have done a minute or 2 less. The only substitution I did was using coconut oil instead of butter. These were delicious and I’ll be making them again. Turned out great! We did the mini muffins. Very tender and tasty. My little ones loved them. We did not add extra chips on top. The only thing I did wrong was that I did not fill some of the muffin tins enough. I think this recipe is sure to become a family favorite! Thanks for posting this! I tried it tonight, and they are amazing! I’m impressed at how wonderfully light and moist these are; they don’t taste “whole wheaty” at all. I doubled the recipe and made 12 full-size muffins–doubling the recipe fills them to make nice, big muffins. I baked at 350 for about 25 minutes. I also used non-mini chocolate chips, which are tasty but did stick to the muffin tins even with nonstick spray. Next time I’d make them with paper liners. I’m so glad your toddler liked them! Love that she’s excited to share them with her classmate. I miss the preschool years!